The news of an electricity program leaked out Tuesday night: by Friday even the press most favourable to the government was aware that the government was gaming somebody. The news during the week noted program including the OCEB, OESP and DRC (I'll get to each), but didn't pay much attention to an equal number of customer classes, each of which is impacted differently by changes the government is making. Confusion continues to be built as new and changed programs continue to be introduced to counter the impact of other new and changed programs. In the end the sleight of hand this week disguised charges to businesses via their electricity bill to fund a government's social program. Qualifying individuals could be eligible for a $20 to $50 monthly credit based on the size of the household and income. New program, new acronym: OESP. This math didn't work for the information presented in most media this week. There are about 4,5 million residential customers in Ontario, so if 1 out of 9 is getting $27, the other 8 out of 9 would need to pay $3.38 - which is not "less than a dollar a month." The trick is that most usage in the province is not in residences. Of roughly 140 terawatt-hours (TWh - a billion kWh) consumed in Ontario each year, the Ontario Energy Board (OEB) 2013 Yearbook of Electricity Distributors showed about 40 are residential consumption; roughly 500,000 other customers consume the rest of the power. The trick is that the under 5 terawatt-hours that might be consumed by households eligible for the OESP won't be funded only by the other 35 TWh of residential consumption, but by all of the other 135 TWh of consumption; 135/5 = 27 and that's the equation that gets to be less than $1 per month for the 27 out of 28 ratepayer to fund $27/month for 1 out of every 28 ratepayers. The bulk of the financing of the OESP social program will come from non-residential ratepayers. That's the only news originating with the March 26th announcement, but there was so much confusion in mixing in previous announcements, I'll revisit other issues. Ending the OCEB as of January 1, 2016 is a win for taxpayers, and a loss for residential electricity ratepayers. Often the two groups are the same, so it accounts to paying your electricity charges on your bill now instead of collectively borrowing for a portion of it to pay it later. According to the 2014 Ontario budget the program cost a little over $1 billion a year - expected to be $1.1 billion in its final year as price inflation makes 10% of the bill a greater number. The debt retirement charge is being reduced from residential bills, but not all bills. The government's press release on the OESP included, "the Debt Retirement Charge for all residential consumers will be removed from the bill." This simply reiterates news from April 2014, which specified "The DRC would remain on all other electricity users’ bills, including large industrial users, until the residual stranded debt is retired – this is estimated to occur by the end of 2018." 40 TWh of residential consumption in a 140 TWh Ontario maarket means that of the approximately $940 million of revenue the budget anticipates from the DRC, only ~$283 million comes from those residential consumers; the remaining $657 million will continue to be recovered from businesses after 2015 ends. It's been three and a half years since I wrote Retire the Debt Retirement Charge, and most of my work there was supported in subsequent reporting from the Office of the Auditor General of Ontario. The government dropped its calculation of the debt the charge is intended to service by $1.3 billion in its last report (essentially for 2013), and the subsequent year saw profits at Hydro One and Ontario Power Generation (OPG) up over $600 million, to $1.56 billion. Even if I wasn't skeptical the charge should exist now, I'd be extremely skeptical it should continue to exist next year. Between the DRC and the billing for the new OESP there's essentially $800 million being collected from Ontario's business, via their electricity bills, as taxes for social welfare programs and other political goals. In moving from "electricity at cost" to electricity as profit centre, we tax electricity as a sin, like tobacco and alcohol. This is not the only additional cost the Wynne government is adding to smaller business, which themselves almost seem to be considered a sin. One exception to moving costs to business for 2016 provides a benefit to a particular group of industrial users. The government announced, in April 2014, the expansion of the Class A Global Adjustment program. I'm working on an article in which I'll show the original program (at the 5 MW level) transferred approximately $300 million in costs from Ontario's largest electricity consumers to all others when introduced for 2011, but that has grown to about $650 million in the past 12 months. The reference to "off-peak" hours in the news release shouldn't be confused with time-of-use periods. The "Class A" hours of import are the annual period's 5 highest daily peak consumption hours - although defined in a way that I would not consider a measure of consumption. The second highest peak for the current annual "Class A" period occurred during an "off-Peak" time-of-use hour under the regulated price plan. The reality of the program is that customers in the "Class A" category pay a significantly smaller share of the total cost of supply than their total consumption would indicate they should were costs distributed proportionately. All costs do get distributed; so the savings of "15 to 20 per cent" for 3-5 megawatt average monthly peak demand consumers will come at the expense of smaller consumers. Unfortunately, it's difficult to estimate the volume of consumption that will be added to Class A category as the threshold level for participation is lowered. If hundreds of additional consumers do join, that would be significant as it would likely double, or more, the number of participants. If we assumed 50% growth the Class A consumption, with new entrants having the same lucrative consumption pattern as current Class A entities and the global adjustment continuing to be the majority of the unit cost of the electricity commodity, then the new cost transfer to smaller consumers, including residential ones, would be $325 million. It was widely reported last week that the removals of the debt retirement charge and the OCEB would work out to a $120-$140 average increase in residential electricity bills in 2016. That is sort of true, but it's both a small part of the increase likely to be seen in 2016, and the most justifiable portion of the increase. The increase due to removal of the OCEB is not really a new cost, but a proper shift of cost from taxpayer to ratepayer. The new Ontario Electricity Support Program (OESP) will add $20 million to overall cost (for the administration) while shifting up to $12/year from other residential ratepayers, totalling around $50 million/year. Not so bad, except all the now normal inflationary pressures continue on the cost of supply (wind, solar, public sector pension costs, ...). 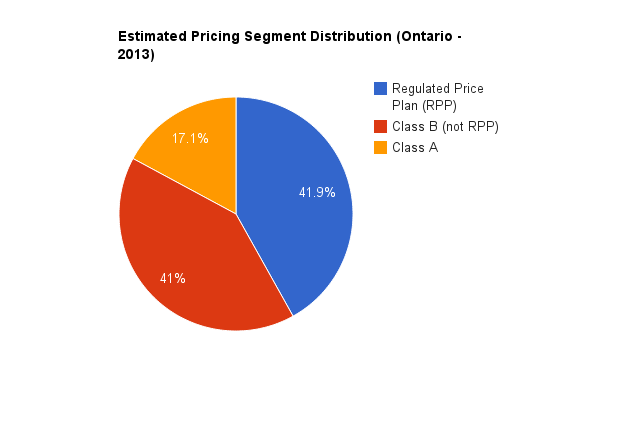 Regulated Price Plan Rates have been growing at 8-9% a year since 2007 and that will probably continue, while the Ontario Energy board continues to approve distribution rate increases. For residential consumers, things will be as bad as usual, and seem worse as taxpayers will be off the hook for the OCEB. I've always felt the role of the Class A program was to shift costs off of industrial users that couldn't compete with much lower costs in other jurisdictions. If it has worked to do that, and I suspect it has, these unnecessary charges/taxes are counterproductive at best. If the government can't admit the DRC is done and paid for 2016, they could at least be intelligent enough to use that DRC tax to fund the OESP, instead of being willfully blind to the economic interests of Ontario's businesses.